Sri Berkat is now blooming! 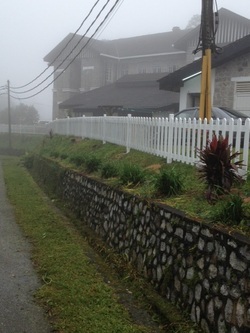 Fraser's Hill includes seven peaks, with altitudes between 1,220 and 1,524 meters above sea level. The Meteorological Department station is measured at 1,280 m. Year round temperatures are between 17°C~25°C / 63°F~77°F. Fraser's Hill derives its name from Louis James Fraser, a solitary Scottish pioneer, who set up a tin-ore trading post in the 1890s. The British army had not explored the Titiwangsa Range, so Fraser recruited guides and coolies for an expedition to the upper ridges, prospecting for gold or other valuable metals. At the top he found an ancient forest of moss-draped trees and ferns with a prehistoric appearance, kept constantly moist in the cloud layer.